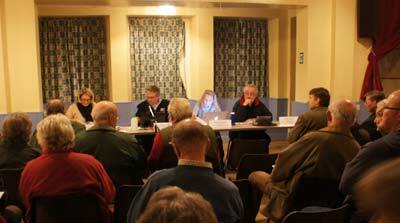 The Meeting of the Farringdon Parish Council Planning Committee held this evening (Wednesday 17th) was well attended, despite the rain, as yet another variation on the Crows Lane Application came up for discussion. 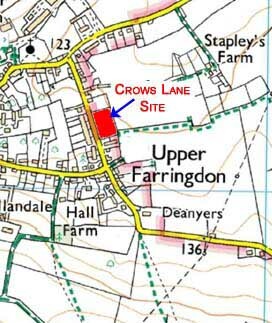 The re jigged planning application to build houses on the paddock on the Eastern side of Crows Lane, although reducing the number of dwellings from 20 to 14, still hasn't addressed most of the main objections put forward at the meeting which considered the original application earlier in the year. Despite the reduced number of houses, still considered far too many for such a small site by most of the those present, the current outline plan does little to meet the inevitable problems with on street parking and the increased congestion along Crows Lane and the increased traffic around the Village generally. Planning Chairman Jeremy Cowan, using a microphone to overcome a partial loss of voice, kept the meeting on track while providing plenty of time for the audience to express their opinion without repetition, hesitation or deviation. In essence the objections to this application were much the same as those made against the previous plans and while the design has reduced the density, 14 houses crammed into a 1.7 acre ( 2/3 ha) site would be more suited to an urban environment that a rural village location. Just to give some comparison, in East View Gardens, formerly Council Houses on the west side of Crows Lane, there are 6 semi-detached dwellings occupying the same frontage as the proposed site on western side of the lane. It is difficult to see how Planning Permission can be granted to this application when the previous one was refused, in essence very little has changed, the application is an over development in a rural village setting and has not addressed the fundamental problems associated with a large development on this site.